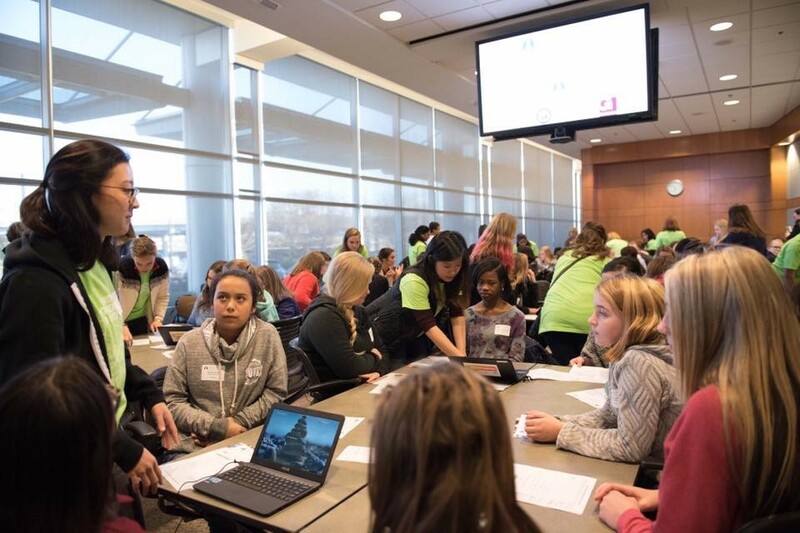 WFA Girls of Promise® Coding Summit at Acxiom in Little Rock attended by 125 Arkansas girls from 22 schools. (Little Rock, Ark.) 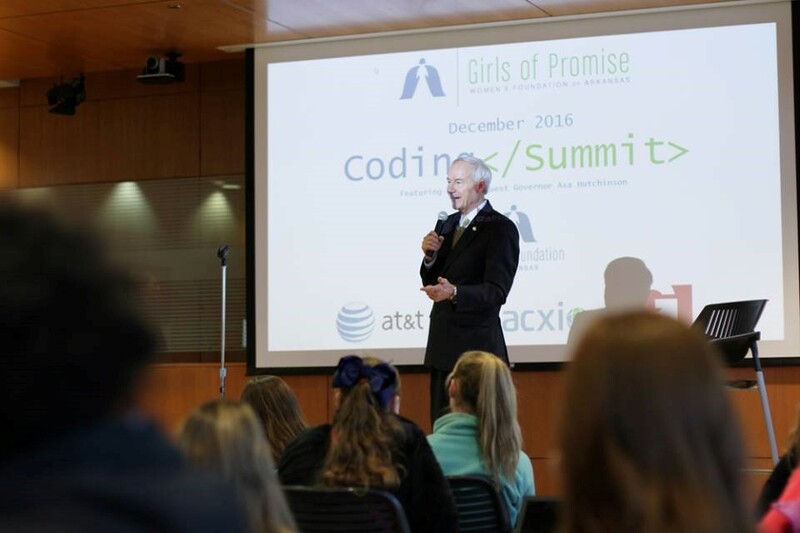 – The Women’s Foundation of Arkansas sponsored the third Girls of Promise® Coding Summit at Acxiom Corporation in Little Rock on December 9, 2016 in honor of Computer Science Education Week. The summit was attended by more than 120 6th through 12th grade girls from 22 schools across the state Arkansas. The event was sponsored by Acxiom, Garver, and AT&T. Anna Beth Gorman, Executive Director of the Women’s Foundation of Arkansas, welcomed the crowd of girls, chaperones, and champions, sharing that the Women’s Foundation’s mission is to engage people to promote women and girls in Arkansas, so they can realize and achieve their full potential. The Girls of Promise® coding summit exemplifies our mission. Governor Asa Hutchinson was present to welcome the girls to the event. The Governor spoke about his bi-partisan initiative to require computer science in all high schools in Arkansas, the first in the nation – and passed during the last General Assembly. He spoke on the success of that initiative and the increased participation in computer science classes across the state. He also encouraged the young women to seriously consider pursuing technical professions in the future because they provide higher paying jobs in the digital economy, which would benefit not only themselves but also their communities. Special guests also included, Janet Cinfio, CIO, Acxiom Corporation; Ed Drilling, President, AT&T Arkansas; and Kathy Kleiman, Founder ENIAC Programmers Project. Each of the guests addressed the girl participants, informing them and encouraging them about their potential role in shaping the future of how we use technology. 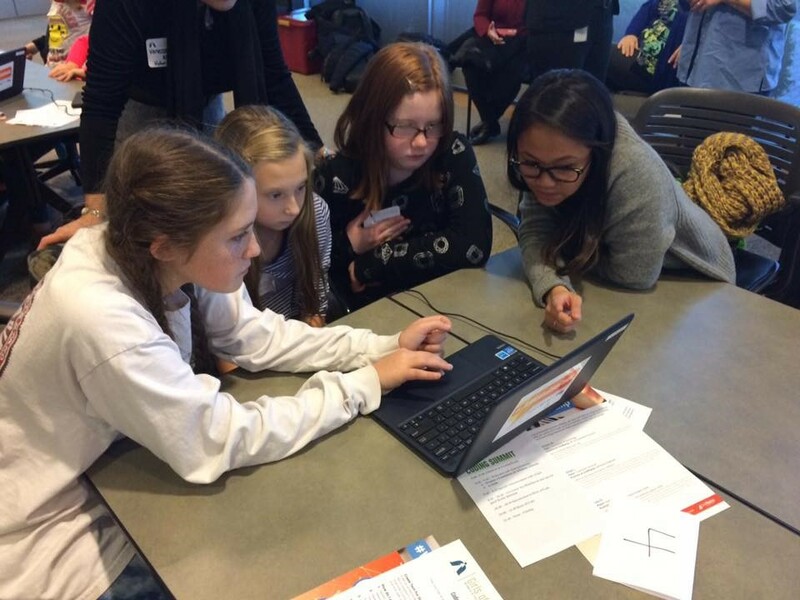 A diverse group of women were on hand as instructors and mentors for the hour of code. Volunteers from Acxiom, Garver, and the Museum of Discovery were present in helping girls navigate through the Code.org modules if they needed assistance. Anna Beth Gorman, the Executive Director of the WFA closed the event by discussing the WFA’s Girls of Promise® Tech Contest sponsored by AT&T. 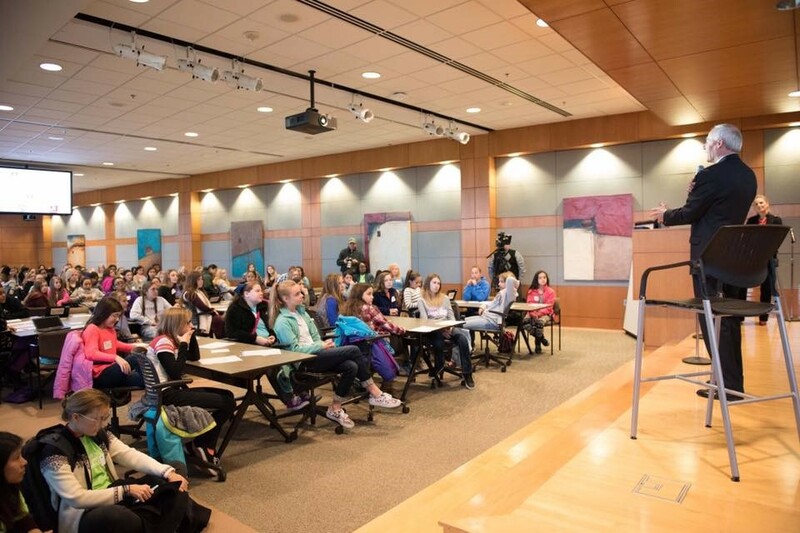 The contest, open to all 6th through 12th grade Arkansas girls, is designed to help girls “create tech for good” by first identifying a need in their community. Applicants will create or build upon a technical product – an app, website, computer program, 3D printer template, or anything else tech – for a philanthropic purpose. Submissions must either directly benefit or provide a service on behalf of a nonprofit organization, church, school or government agency. Finalists will present their submissions at the Girls of Promise® conference in Little Rock on April 13-14, 2017. Conference participants – 8th grade Arkansas girls interested in science, technology, engineering and math – will vote on the grand prize winner, who will receive an Apple Laptop. The runners-up will all receive tech prizes as well. Full details are available at girlsofpromise.org/techcontest. The WFA will host another Coding Summit for 6th-12th grade girls early summer of 2017. Anna Beth Gorman is the executive director of the Women’s Foundation of Arkansas. Informative blog. thank you for sharing with us..
Why you should celebrate Women’s Equality Day!